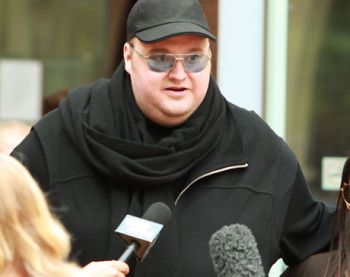 Vikram Kumar wants to make sure everyone understands what Kim Dotcom's new file sharer is all about. "The segment that seems to be most interested in Mega, and in paying for space, security and privacy tends to be professionals," says Vikram Kumar, CEO of Kim Dotcom's Mega, speaking via Skype at a London Copyright and Technology conference. Dotcom's previous enterprise, Megaupload, was raided at the urging of the FBI - an action that the courts later ruled was illegal - and the fallout was so intense that New Zealand's PM was forced to apologize. Dotcom's still embroiled in legal entanglements as a result of that copyright infringement allegation, and his potential extradition to the US to face charges is unresolved. But Mega is definitely not a piracy service, and its CEO is keen to make sure that everyone understands that. In essence, says Kumar, Mega is a faster and more secure Dropbox. It still attracts attention; about 2 to 3 million files are uploaded to Mega every day, and it gets around 100 takedown notices for alleged copyright infringement each day too. But, Kumar points out, that's nothing compared to other services. YouTube, for example, gets 15 million takedown notices each month, or about half a million per day. "The numbers tell us that Mega is not being used for wide-scale copyright infringement," says Kumar. Mega's also keen to ensure that external search engines don't provide indexes of Mega content. If they did, then potentially outsiders could use Mega as a copyright infringement service; Mega insists on public sharing of decryption keys for content, but a private index could bypass that rule. Kumar doesn't want those sites out there, and if they use the Mega name in any way that suggests the index is linked to the company, Mega will take action for trademark violation or fraud. Nor will Mega allow streaming music or films, even if the one doing it is the copyright owner. "That's not Mega's purpose," says Kumar, possibly with one eye on the Dotcom raid video. The big benefit Mega offers is security, says Kumar, which appeals to lawyers, financial advisors, and other people whose major concern is client confidentiality. They want privacy, and Mega provides.